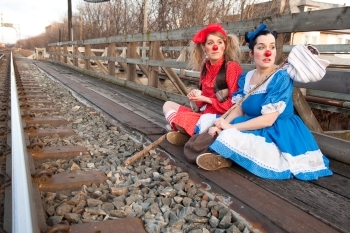 Of Mice And Morro And Jasp, playing at the Toronto Fringe Festival, is the clown duo’s take on the American Depression classic novella Of Mice And Men. Steinbeck’s grim tale may seem unlikely for a comic reimagining, but all good clown has elements of tragedy. And Morro and Jasp, well-known and respected in the theatre scene, are as adept as ever at evoking real pathos through their hilarious antics. Their relationship, established in their previous performances (though you don’t need any prior experience to appreciate it) is perfectly suited to the two protagonists of Of Mice and Men. Jasp is stern, practical and in charge, the obvious George. Morro, the silly fool, well-intentioned but always getting into trouble, is poor, doomed Lenny. You’ll have to laugh at this show, even if you haven’t read Of Mice And Men, or barely remember it from your high school curriculum. Their dynamic is irresistibly engaging, and they are fantastic physical comedians. Vocal as well: Morro’s singing and Jasp’s loud exasperation are continual sources of amusement. Of Mice And Morro And Jasp doesn’t have the same small-space intimacy of the last show of theirs I saw, Morro And Jasp: Go Bake Yourself (nor is it quite as messy), and while I missed that, these ladies deserve the bigger audience. I don’t want to give away anything that actually happens in the show. But I was glad I was there for the first performance because I got to see something very special: at the curtain call, as the two were about to walk off stage, they were pulled back by a trio (including, I think, their director, Byron Laviolette) who presented them with their Dora, which they were not in town to receive at the ceremony. It was a touching and jubilant moment. Get your tickets now, this show will sell out. Though I have no doubt these incandescent clowns will be back again soon. Perhaps next The Grapes of Morro and Jasp? All individual Fringe tickets are $10 at the door (cash only).